2016 Best of Kearney award! 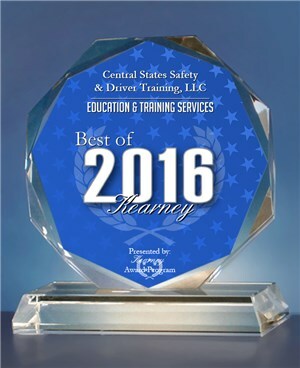 Central States Safety & Driver Training’s is proud to receive the 2016 Best of Kearney Achievement award! The trucking industry is one area that currently has a very high demand for good drivers. Many companies are relaxing their requirements for a driver to have at least 2 years of Over-the-Road (OTR) experience if the driver successfully completes Entry-Level Driver Training Program. A “CDL” is a Commercial Drivers License. It meets certain minimum “standards” that are the same for every state. It differs from the Nebraska “operator’s” or “chauffeur’s” licenses. 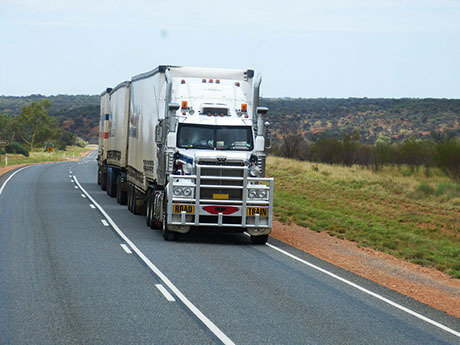 It is required if you drive certain kinds of commercial trucks or buses. What are the eligibility requirements to obtain a Nebraska CDL? You must be 21 years old. (18 years if all commercial driving is done within Nebraska and if no hazardous materials requiring placarding are transported and if you do not drive double or triple trailer rigs). You must be physically capable (in accordance with the MCSR 49 CFR 391.41 Physical Qualifications for Drivers regulations) of obtaining a valid DOT medical examiner’s card (before being issued a CDL permit or taking any CDL skills test). If you possess a license from any state other than Nebraska. If you are currently subject to any disqualification of your commercial driving privilege from Nebraska or any other state. If your license is currently suspended, revoked, denied, or cancelled. If you have a conviction for operating a commercial motor vehicle while impaired in the 24 months immediately preceding application. other technical rules, and further restrictions that pertain only to Nebraska are covered in detail within the Course. How do I obtain a Nebraska CDL? Show your Nebraska driver license. You must take and pass all Nebraska examinations that apply to your license class and endorsement requirements. Show proof of social security number. Meet Nebraska driver record eligibility requirements as determined by the State. Fill out an application including certifications. Provide a DOT medical certificate and pass the required CDL knowledge and vision tests (BEFORE a CDL Temporary Instruction Permit will be issued). Pay the Nebraska CDL fees. Schedule, take, and pass your Nebraska CDL skills test. When do I need a Nebraska CDL instead of my regular Nebraska Drivers License? A vehicle with a manufacturer’s gross vehicle weight rating (GVWR) of more than 26,000 lbs. A vehicle towing a unit with a manufacturer’s GVWR of more than 10,000 lbs. when the GCWR exceeds 26,000 lbs. Carry (15) or less people (including the driver) when carrying children to or from school and home regularly for compensation. A vehicle carrying hazardous materials in amounts requiring placarding. Can i still test at central states safety if i live out of state, and want to join the training class at css? Effective July 8, 2015, out-of-state holders of a Commercial Learners Permit (CLP) can now have the skill tests administered by a Nebraska DMV approved CDL Training School. The results will be electronically transmitted by the Nebraska’s State DMV office to the State’s DMV office where the driver obtained the CLP from. Their CDL will be issued by that state. Example: A person from Ohio who has a valid ohio9 CLP can come to Central States Safety & Driver Training’s School for Training. They can train and legally drive on public roads with their out-of-state CLP. Once their training is finished. Central States Safety will administer the required Nebraska skills tests to the driver. If the driver passes the skills tests, the results will be sent to Ohio’s DMV by the State of Nebraska’s DMV office. The driver must return to Ohio to apply for their CDL. No further testing is required. After completing Driver Education classes with Central States Safety & Driver Training our daughter is much more comfortable behind the wheel and is more prepared now to drive on her own. I think I can sleep at night now. 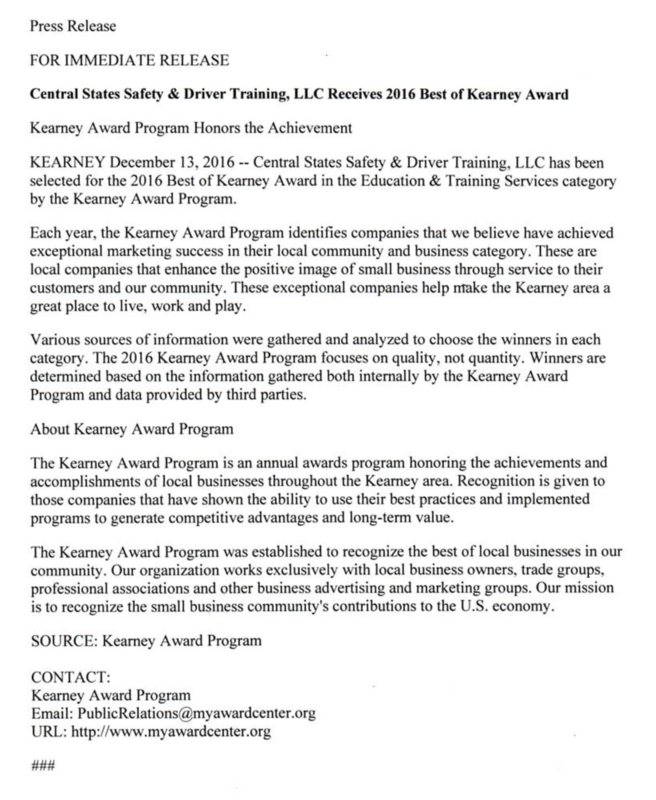 I graduated Central Safety & Driving Training program last month. I had a great experience and I felt comfortable to join those instructors and gain their experience. I want to thank everyone that I met there that gave us advice and encouragement. My best experience was joining this team And I appreciate the manager of the school and his good training.